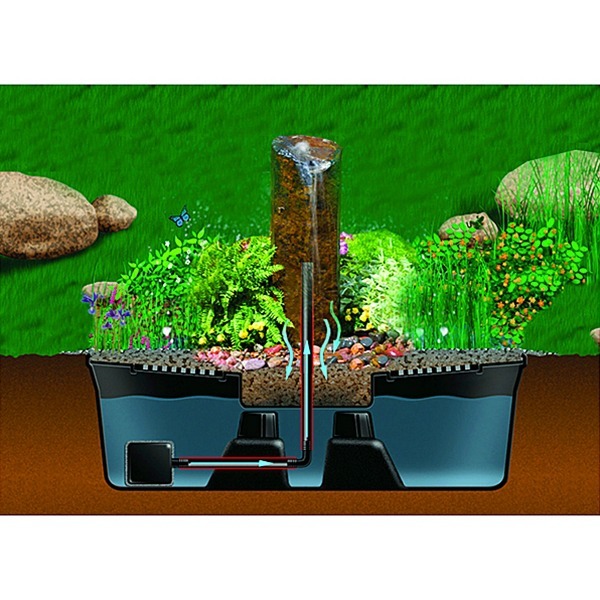 Planting Depth: Plant in moist soil,4″ underwater or above water with constant irrigation. Sunshine: Full sun to partial shade. Size: 1-3 feet tall, & up to 12 inches across. 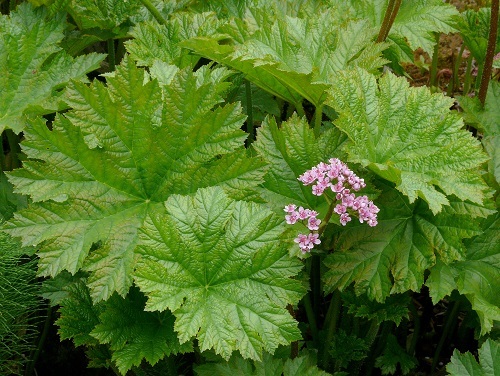 Indian Rhubarb (Darmera peltata) is native to mountain streamsides in woodlands of the western United States. Planting Depth: Top of pot can be under the water line. Blooming Window: Early Spring through Summer. Leaves turn color in Autumn. Use: These tall plants work well as part of a back wall. Mix with some medium-height and lower plants to create a balanced visual effect. They are also good for framing around a waterfall. 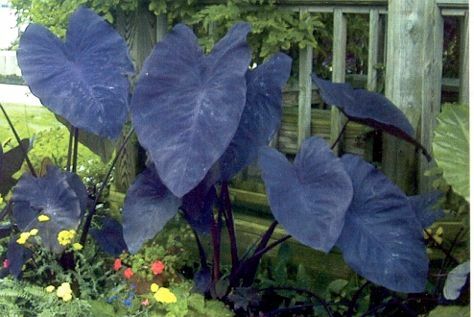 Size: They can grow to be 6-7 feet tall, and up to 3 feet wide, with flowers growing up first before leaves. Start by burying the basin. Measure around the outside and dig a hole deep enough to hide it entirely. Tamp down the dirt and add a thin layer of sand to make it easier to level. Once the basin is level and dirt is packed tightly around the sides you can add the pump and tubing. The pump can be placed inside the basin by removing the lid in the corner. Feed the tubing into the center hole in the basin. 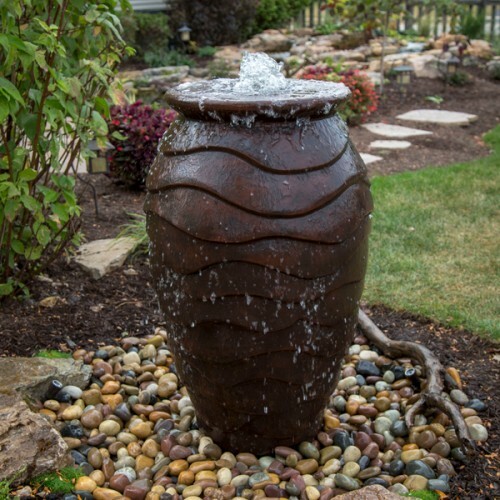 Place your fountain item (rock, vase, spitter fountain…) in the center with the tubing coming up through the hole. 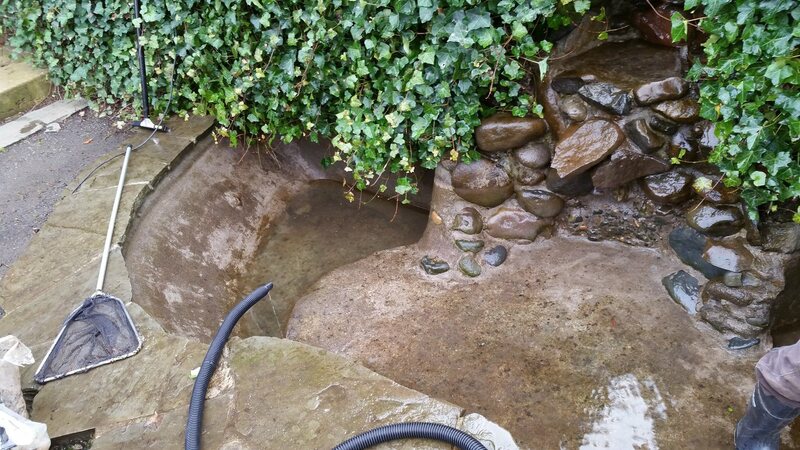 Pour a solid layer of cleaned river rocks over the top of the basin and scattered around the outside of the feature to create a natural blended transition. Fill the basin with water and turn on the pump. 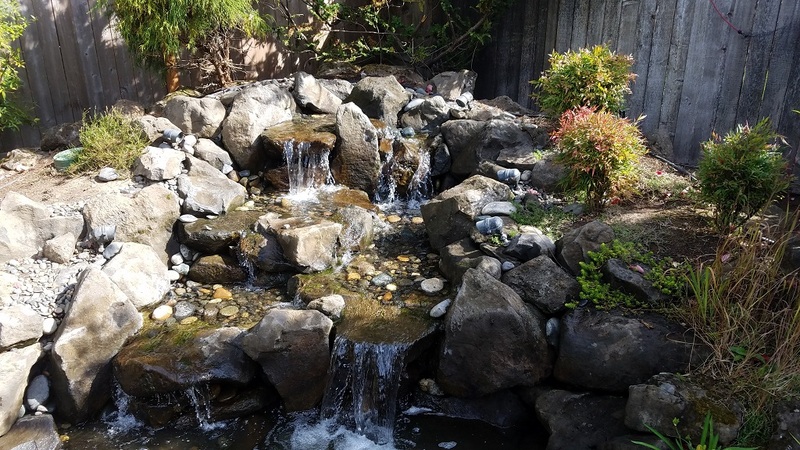 Enjoy the sound of water in your new garden oasis! Add interest to the feature by adding submersible LED lights with a photocell sensor to automatically turn the lights off during the day. Clean up inside the pond. 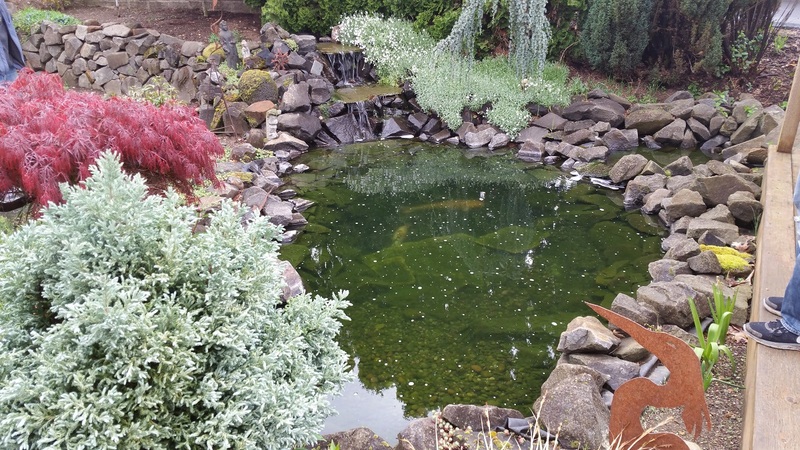 Dead algae, fish waste, leaves and needles build up in the bottom of your pond. All of this will decompose during the winter months. As it breaks down, it will draw precious oxygen out of the water. Clean up around the pond. 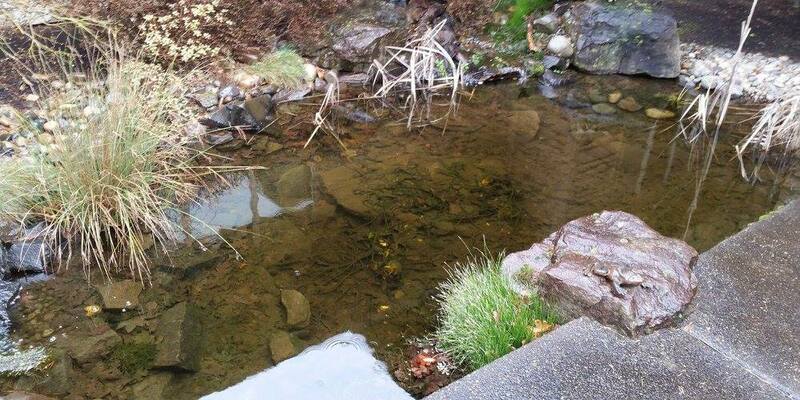 Leaves and other plant debris left on the edge can make its way into the pond. 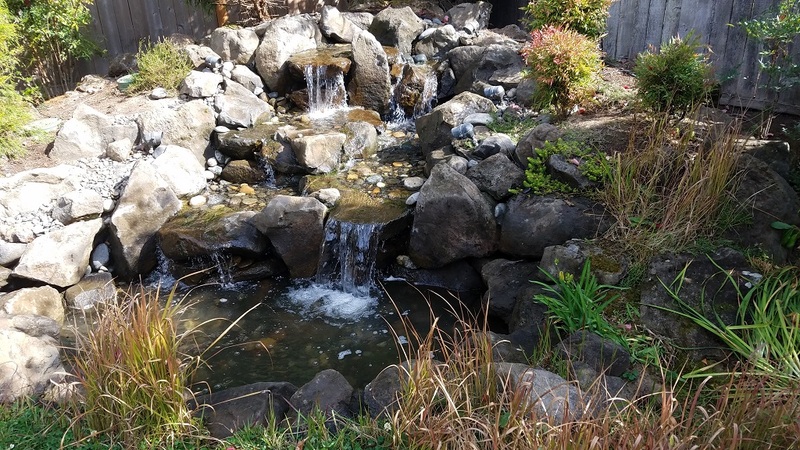 Insects and other harmful organisms can over-winter in the dead vegetation and wreak havoc on your pond plants once warm weather returns. 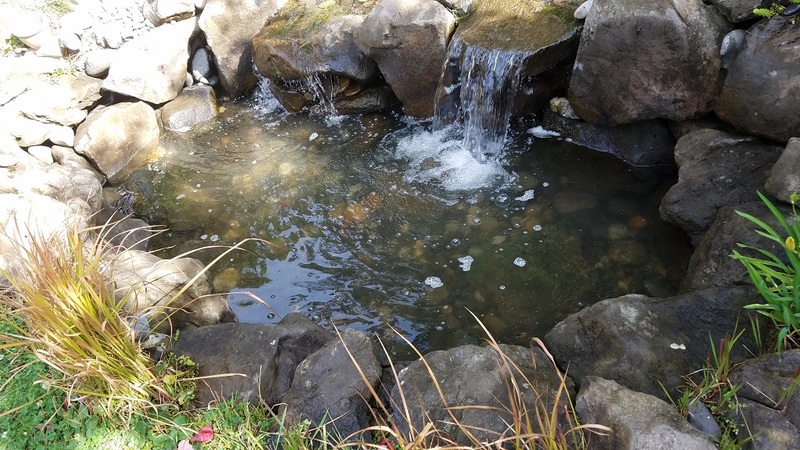 Use pond netting to catch falling leaves before they get into the pond and decay all winter. For better support, use bamboo poles or plastic rods to hold the netting down. 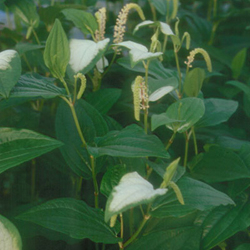 Clean the netting periodically to avoid the leaves steeping which can cause the water to turn brown. Take a weekly measurement of your water quality. 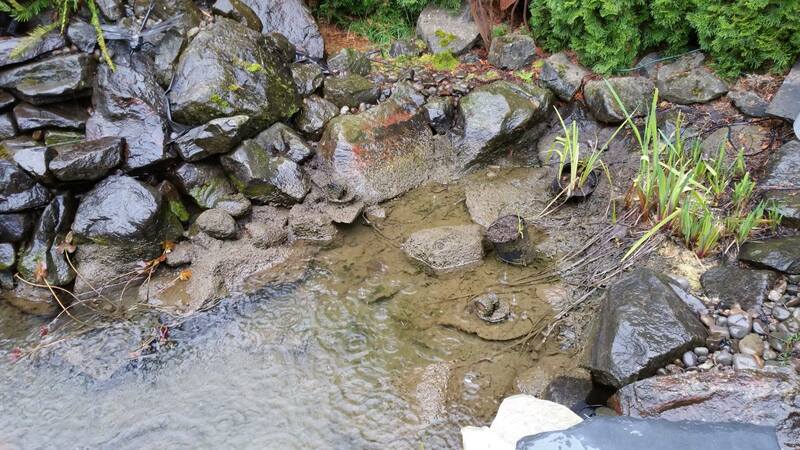 The last thing you want is green algae growing in the fall going into winter. 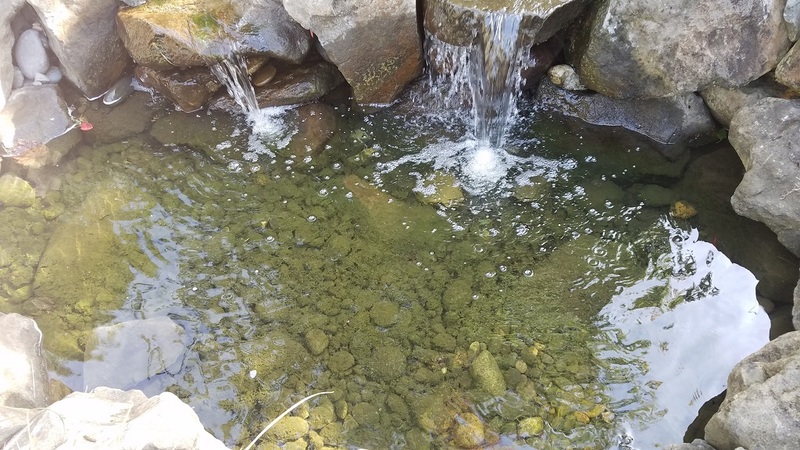 The algae will die and decompose in the pond during the winter, drawing oxygen that your fish and wildlife need to survive. Switch to the autumn/winter formula of positive bacteria. Cold, hardy bacteria will continue to digest the organic sludge that is left behind after the cleaning steps listed above. The enzyme packets included with the bacteria will digest larger debris like leaves and needles. Be careful when letting ice form in your stream or waterfall. 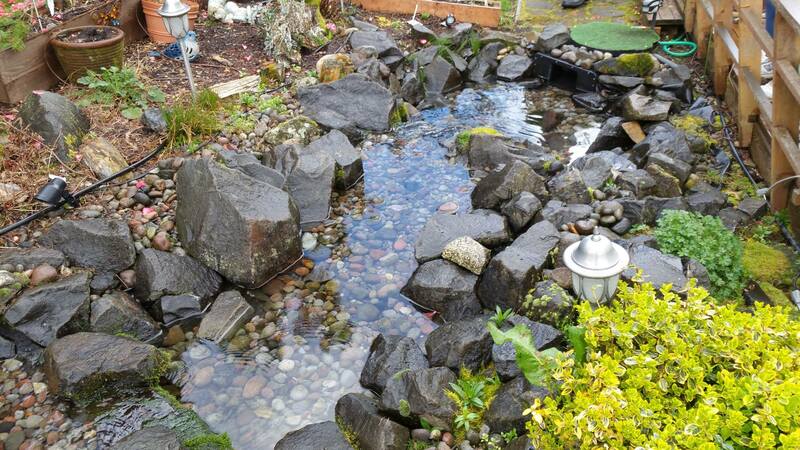 Pond owners sometimes leave their pumps running so that water still flows over their waterfalls when ice is forming. 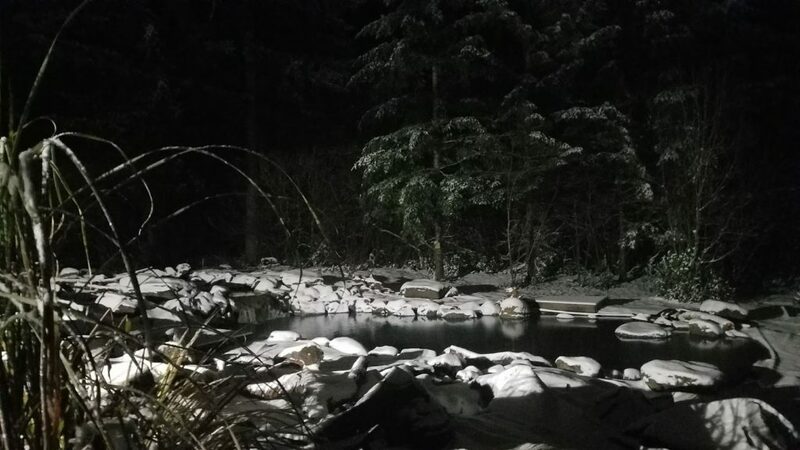 In fact they look forward to the unusual ice formations, which can be among the most beautiful winter scenes the pond has to offer. Be careful, though. 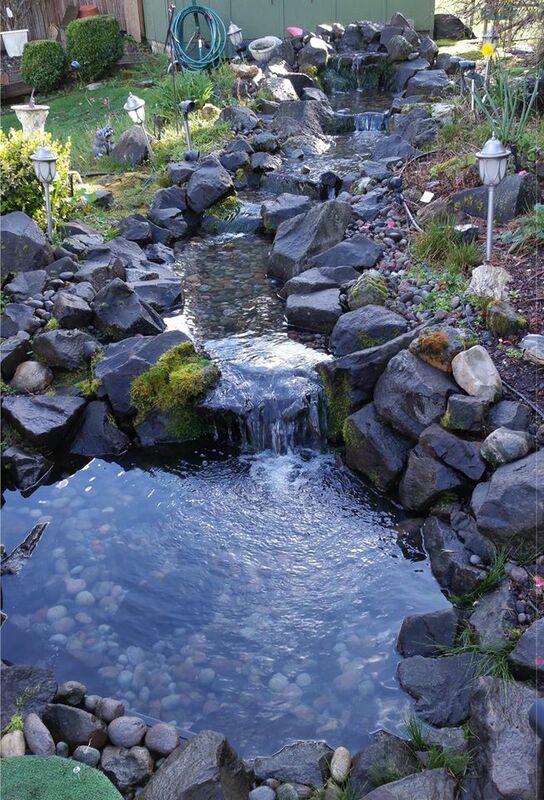 Ice build-up can easily divert running water away from the stream or waterfall. 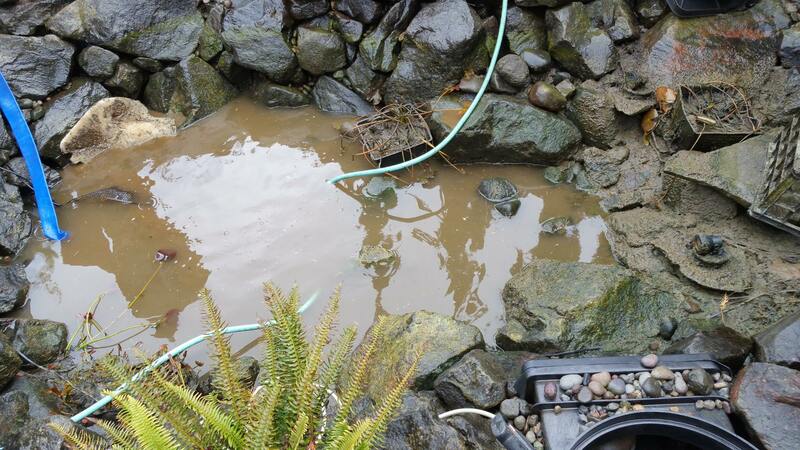 This can quickly drain the pond, to the detriment of your fish and plants. Some water gardeners turn off their fountains and waterfalls, taking out their pumps. 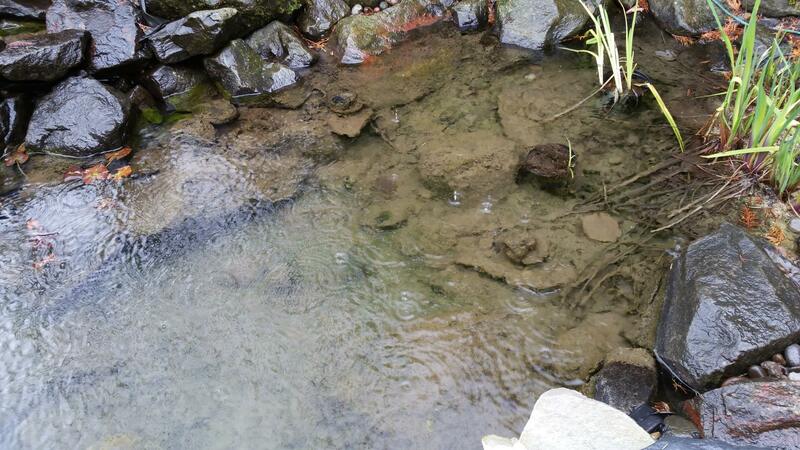 This is OK….if you do not have fish and biological filtration. Make sure the hoses are completely drained. You don’t want water to freeze in the pipes during the winter which makes them more susceptible to bursting. Cap the ends of the pipes. You don’t want furry little animals to use the empty pipe as a nice warm place to nest during the winter. 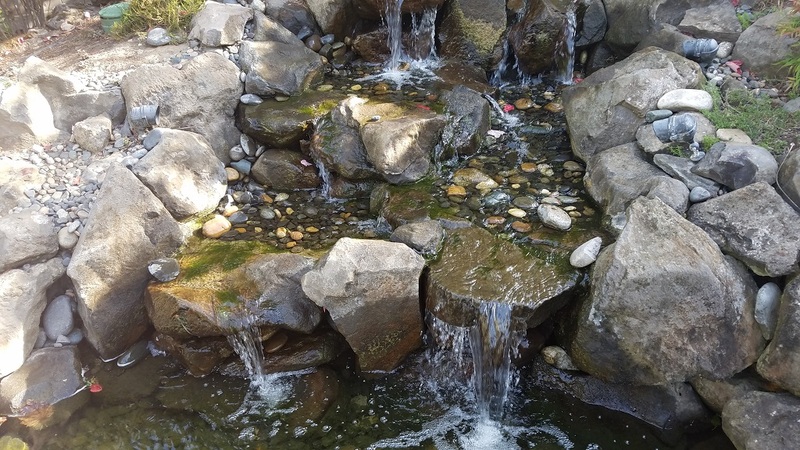 If you have a submersible pump and decide to shut down your pond or fountain for the winter, then store the pump in water and keep it where it won’t be exposed to freezing temperatures. A submersible pump is usually water lubricated. When the water dries in the pump, it can cause the internal mechanisms to freeze or crack and cause problems for you in the spring. Clean, dry and store any ultraviolet clarifiers, bead filters, and any motion-activated sprinklers. The best way to help your fish through the winter is to make sure they are well-fed and healthy during the summer. Take stock of their appearance. Make sure they’re free of disease and parasites. If they’re ill, take care of it now. Stop feeding the fish when morning water temperatures are lower than 50 degrees Fahrenheit for a consistent week. As colder temperatures approach, feed the fish a little less every day. You’ll gradually cut back their intake until they stop getting food at all. They’ll also let you know when they don’t want any more food. Keep the pump running or plan alternate sources of oxygen for the fish. 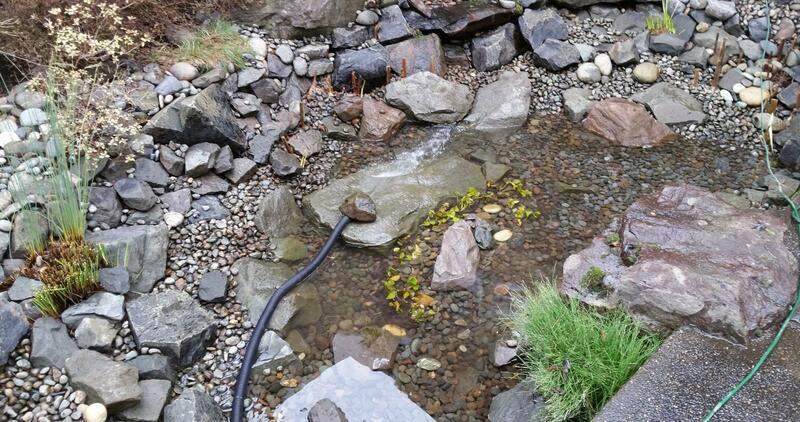 Even with a pump running it is a good idea to add oxygenation with pond aerators. The air stones create bubbles that will work to keep a hole in the ice during freezes. This allows unwanted gases to escape. Don’t try to break a hole in ice, it will cause shock waves in the water that can harm your fish. If necessary, you can use a pot of hot water to thaw a hole. 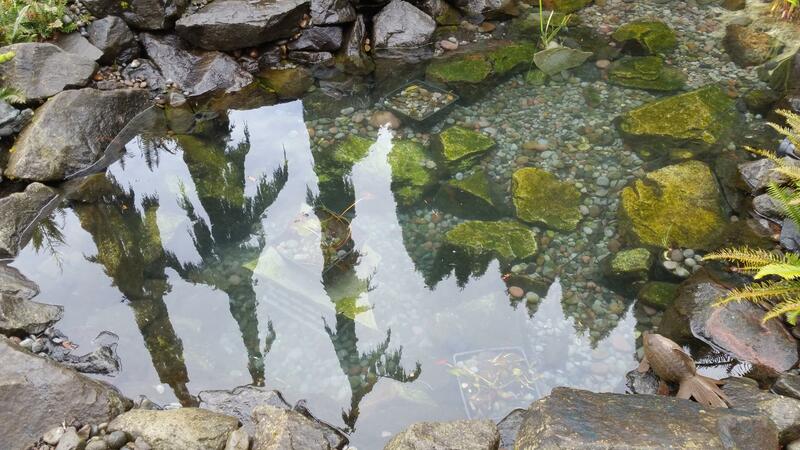 Don’t let the water at the bottom of the pond mix with the water at the top. The bottom layer is warmer and it’s where the fish like to hide and hibernate. 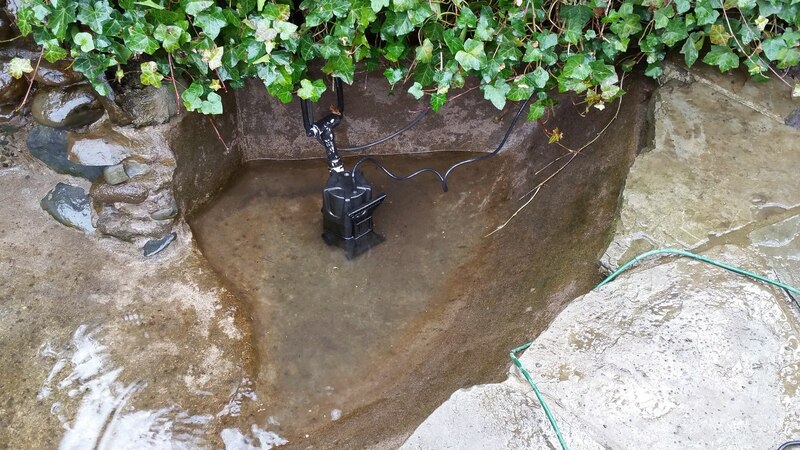 Pull your submersible pump up onto a shelf in the pond so that it’s not in danger of running dry but it’s off the bottom layer. 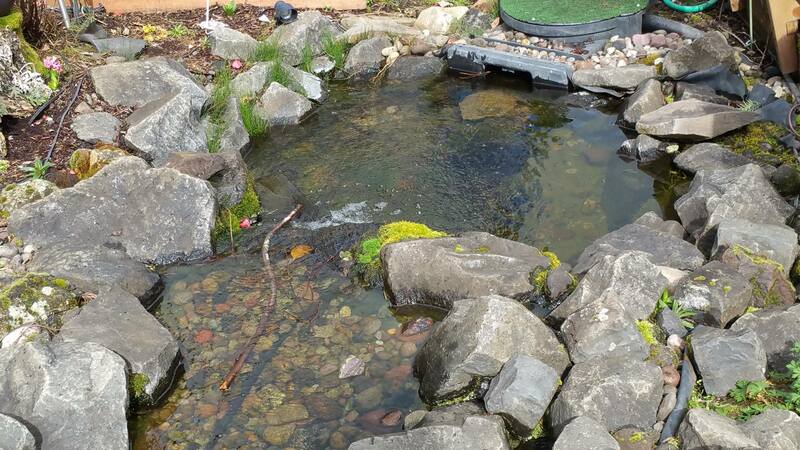 If you add aerators to the pond then place them on a shelf or raise them off the floor onto an upside down plant basket or something taller. Trim back dead foliage and remove spent flowers. 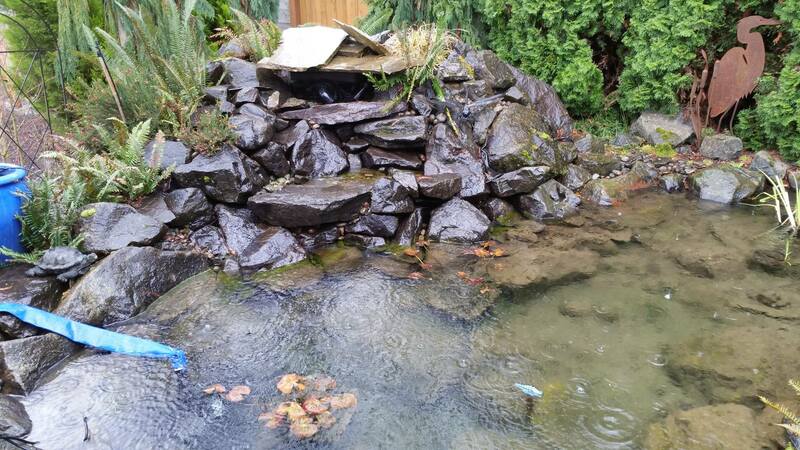 It’s time to remove all of the floating plants that will die off in the winter (at least here in the Pacific NW). 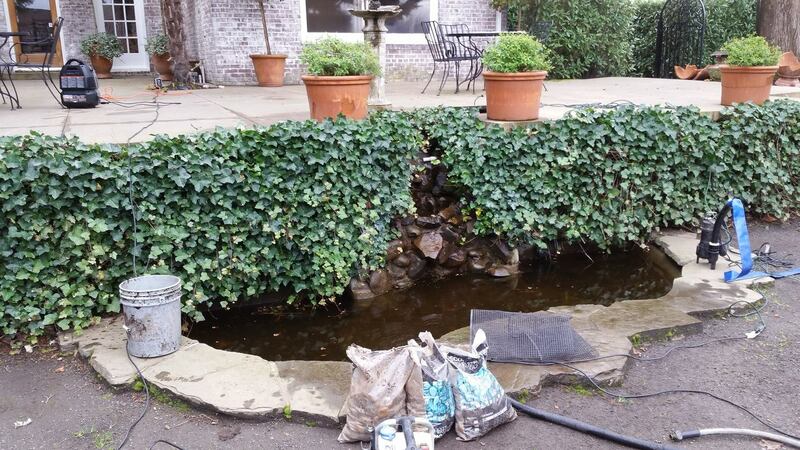 Limit the amount of organic matter decaying in the pond. Stop fertilizing plants about 3 weeks before the average frost date in your area. You want the plants to harden off for the winter, which they’ll do more readily once you’ve withheld fertilizer. Even tropical plants, which you’re going to bring indoors, will benefit from a respite in food this time of year. 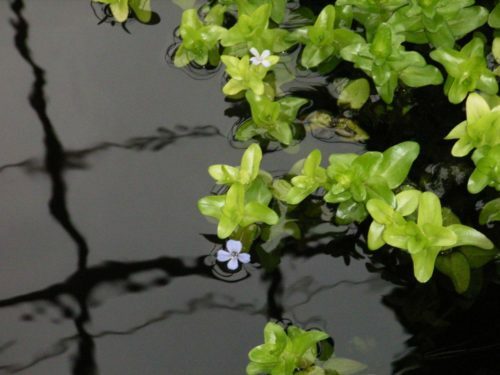 Take tender water plants indoors if you live in a winter freeze climate. 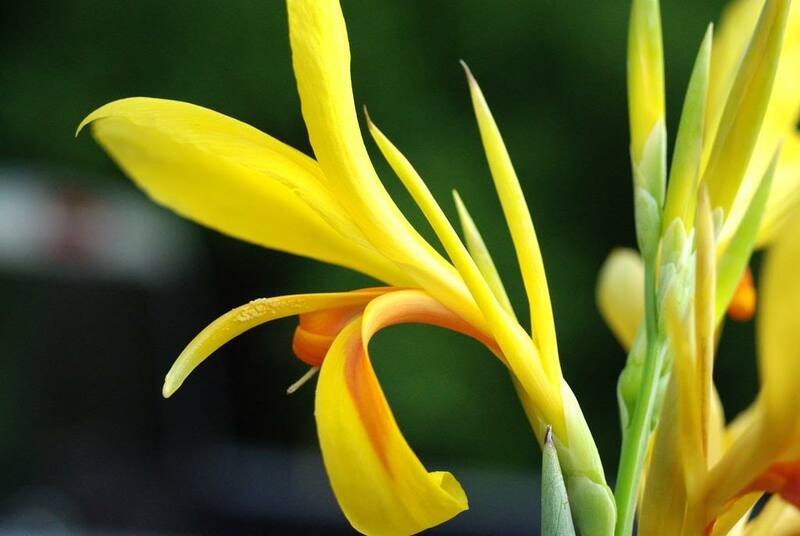 Before a hard freeze you should place tropical marginals in a warm, sunny room with their pots in a saucer of water, so that the water will wick into the soil and keep the plant moist for the winter. 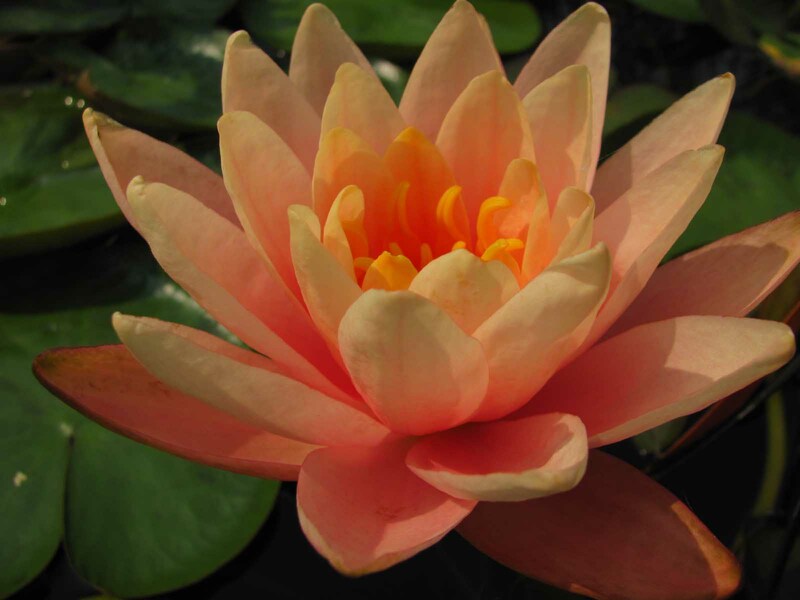 Tropical water lilies will need supplemental light and water that’s at least 65 F for the winter, as will tender waterlily-like plants. 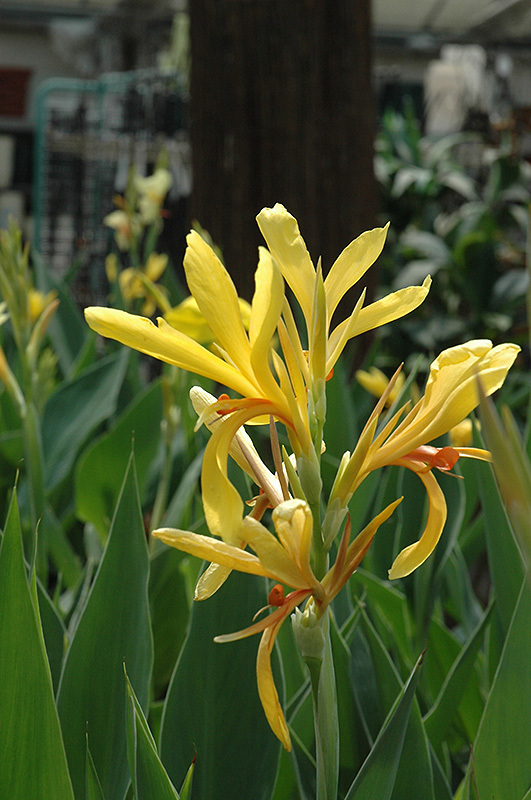 Certain plants, such as cannas and taros, can be left in a cool, dark place for a few weeks without any water. As they dry down they will die back, losing their leaves, and forming a corm or tuber in the soil. This corm or tuber can be cleaned of soil and stored in peat moss or sand for the winter. Re-plant it the following spring. Certain marginals can be safely left outdoors in the hardest of winters. They can freeze solid provided they stay in the water in a matter that the crown of the plant stays moist. 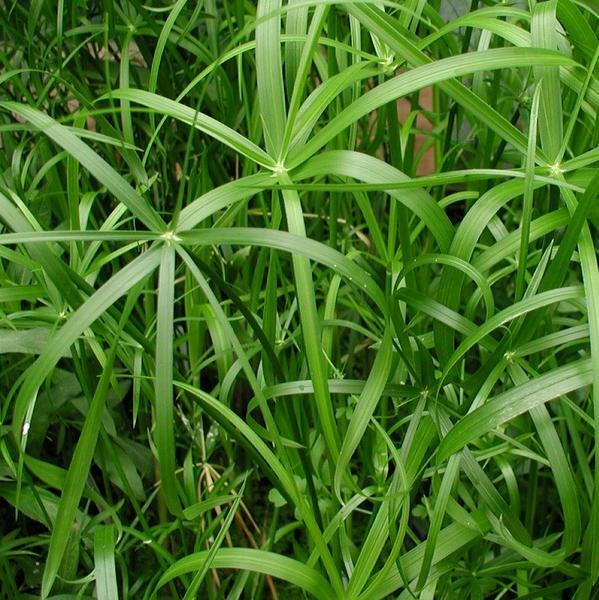 This includes water iris, sweet flag, water parsley, cattails, flowering rush, and many sedges. To overwinter these hardy souls, simply cut back their foliage to within a few inches above the crown once the leaves have withered and died. 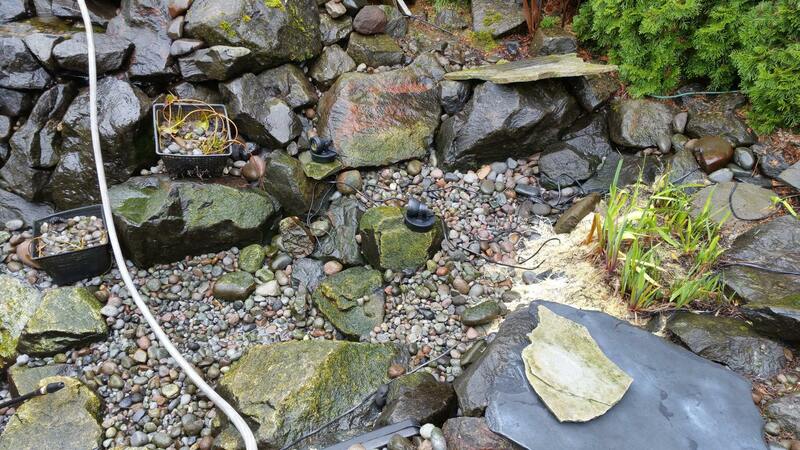 Then just leave the pots in the water in the pond. 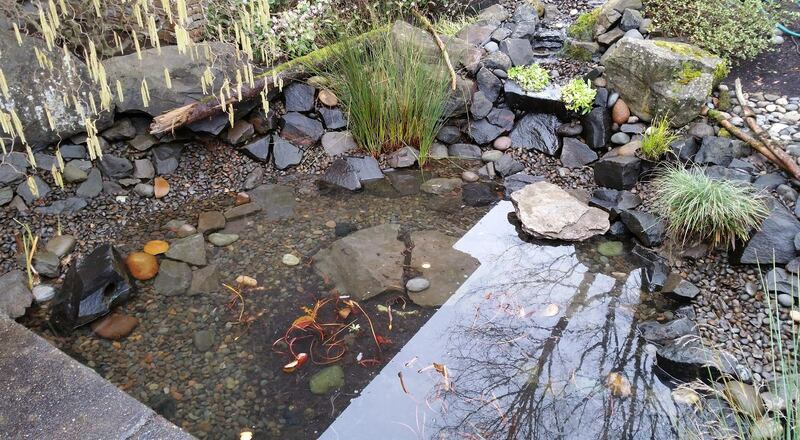 Winter-hardy plants that cannot survive being frozen in the ice should be moved below the frost line in the pond. 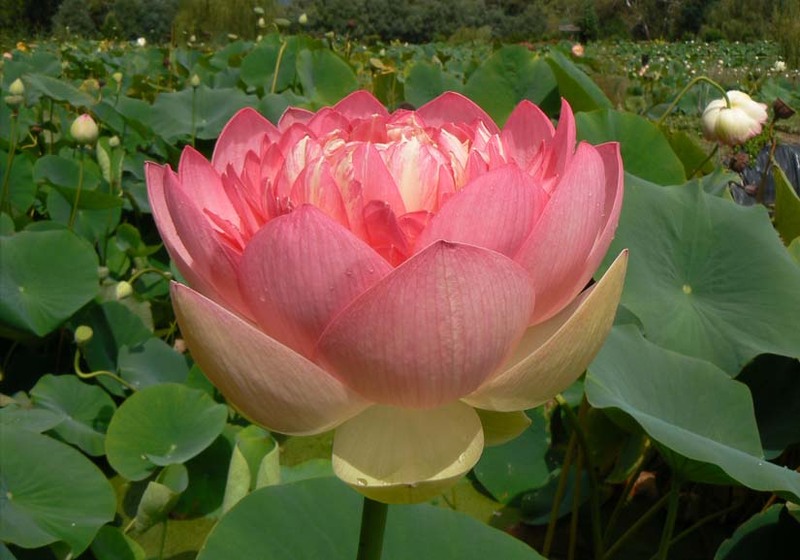 This includes water lilies, lotus and pickerel rush. 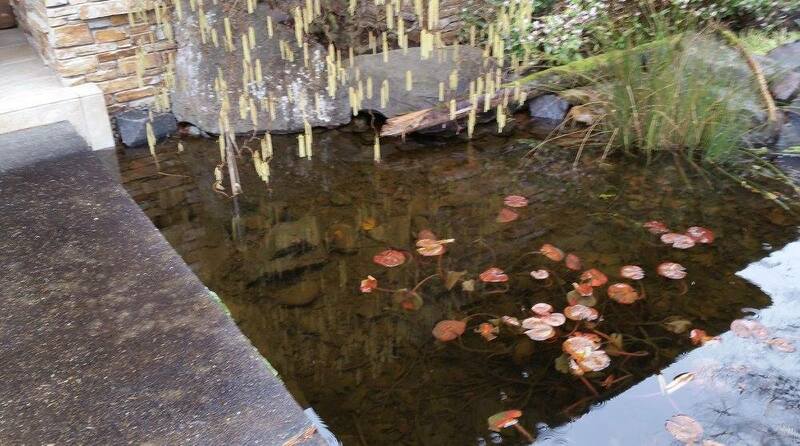 Wait until the plants have died back for the winter and remove their spent foliage before placing them well below the water’s surface. 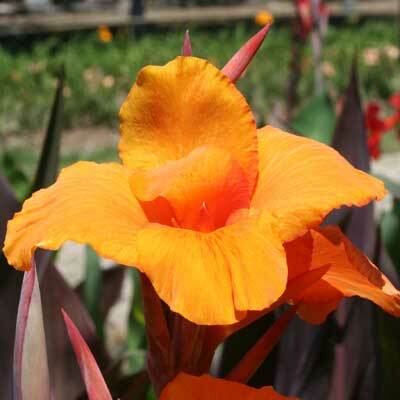 Cannas come in many colors and shapes. 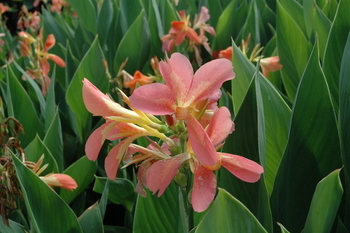 They are a tropical plant that require a lot of sunshine for full blooming potential. 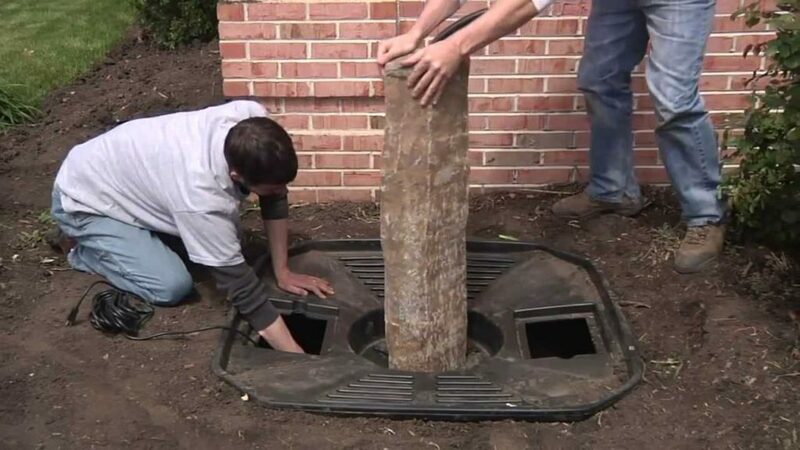 Planting Depth: Top of pot should be 1″ to 4″ above the water line. Large double blooms open deep pink, changing to pink with yellow, and then to yellow. Especially free flowering, pleasant fragrance. 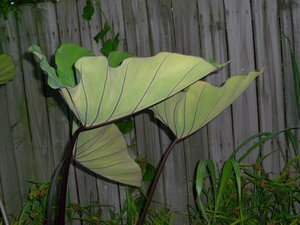 Leaves grow 18-24 inches across. Plant grows 4 to 5 feet tall. Fertilize well in the Summer. 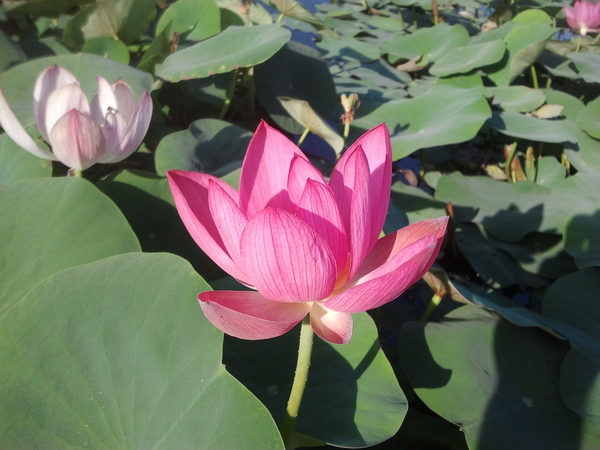 Fast-growing, aquatic or semi-aquatic, perennial plant native to Europe and Asia, and one of the oldest known leaf vegetables consumed by humans. 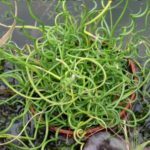 is a perennial semi-aquatic vegetable plant known for its spicy foliage that’s popular in salads and similar dishes as a peppery, tangy flavor. The hollow stems of watercress are floating. 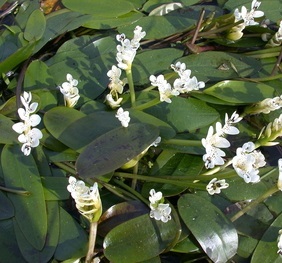 Small, white and green flowers are produced in clusters. Single large stems can be allowed to grow slowly upward. 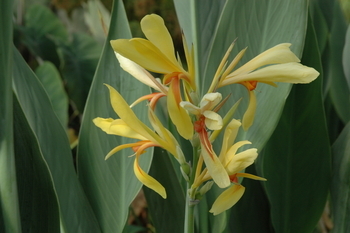 A group of such specimens will produce long, solid stalks with circumferential leaf groups. This technique can create a strong vertical element in an aquascape. When cut or crushed, the plant produces a strong lemon-mint smell. 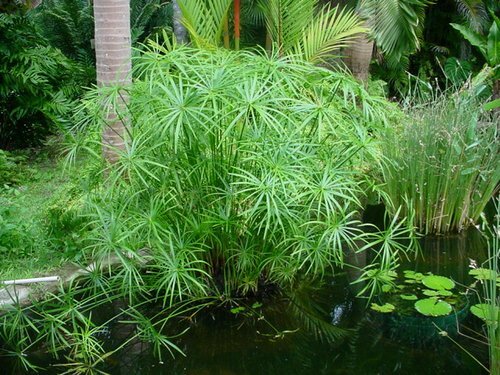 B. caroliniana can also be kept in outdoor ponds or tubs. 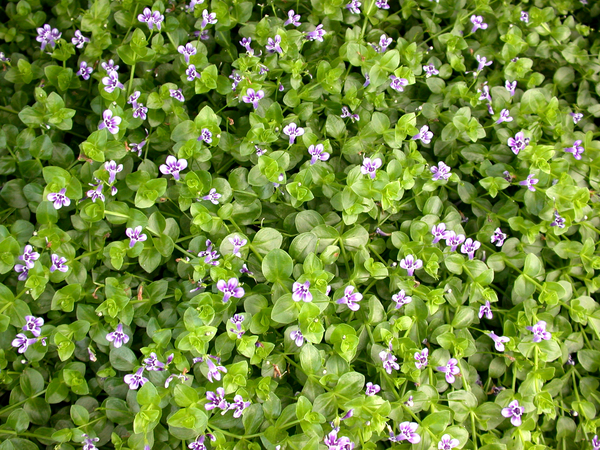 When allowed to grow in an immersed state, it will produce characteristic small purple flowers. Tropical, free floating plant. Velvety ribbed leaves form delicate, pale green rosettes. Resembles a cabbage plant. 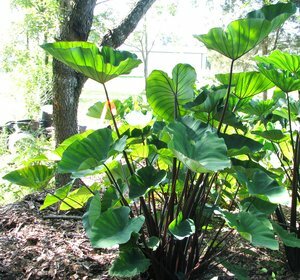 The leaves grows 8 – 10 in. long and 4 in. 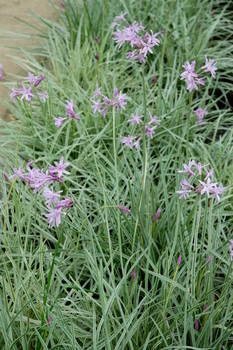 wide and produce plantlets that stretch out from the mother plant on slender stems. These can be separated and the older plants can be thinned out. 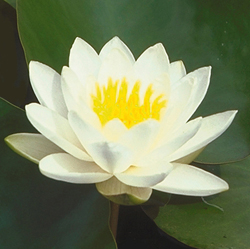 If yellowing occurs the plants can be separated from the pond and fertilized. Excellent in shady ponds. 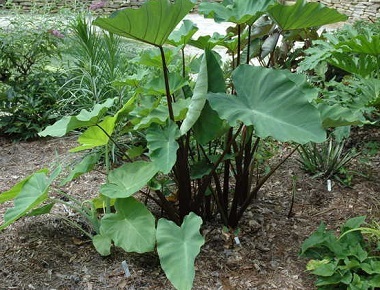 Aztec Arrowhead has large, stiff, spear-shaped leaves that are produced at the end of thick stems. 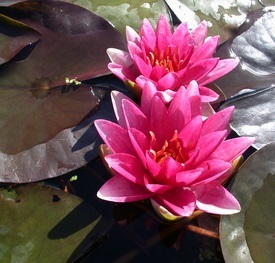 They may grow 2 to 4 feet tall and should be kept in 1 to 6 inches water depth. Sagittaria montevidensis flowers bloom all season, are white with a large dark red spot at the bottom of each petal and have a yellow pistil and stamen. 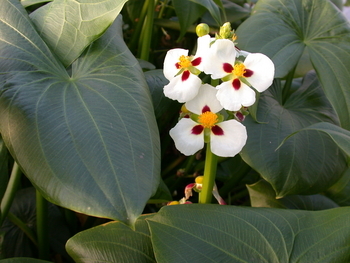 Use: The Arrowhead has a very unique bloom with amazing foliage. 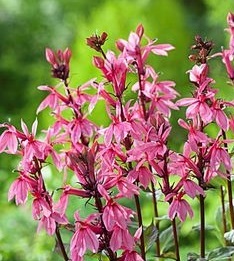 Use it in the bog in the shade or as a lower plant in front of something tall. The diffused light serves this plant better than full, direct exposure. Full sun generally brings out the best leaf color in this beautiful giant. 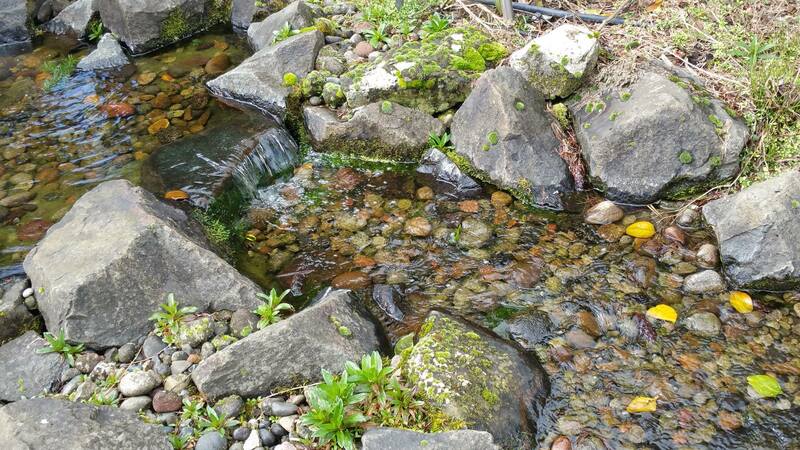 Great as a pond marginal in water up past the top of the pot. 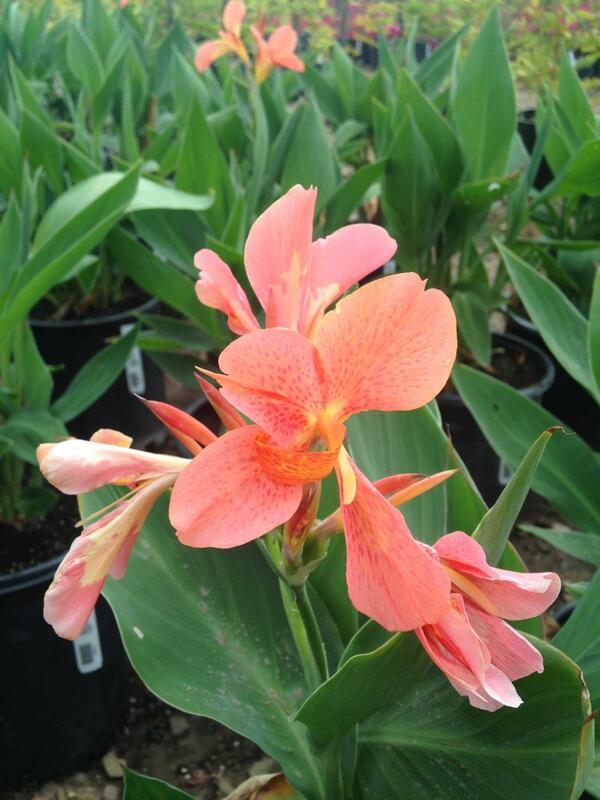 Plants produce prodigious amounts of growth and appreciate regular fertilization during the growing season. 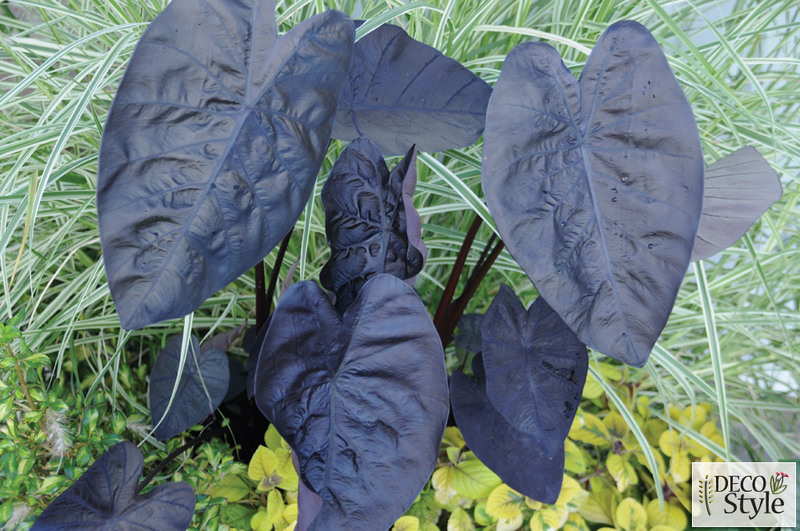 This gem makes a bold statement in the garden with 6 foot deep purple stalks leading to 3 foot long giant green leaves with a slight hazy purple cast. 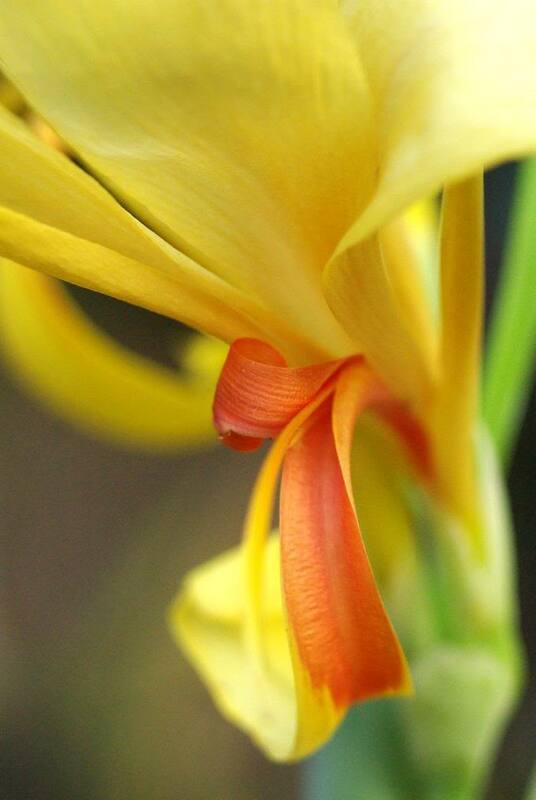 The 1 foot tall yellow flowers have a wonderful papaya-like fragrance. 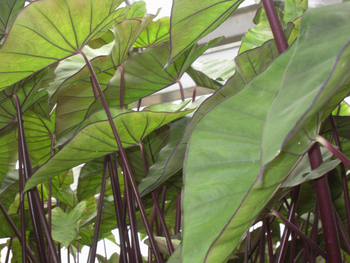 Colocasia esculenta is thought to be native to Southern India and Southeast Asia, but is widely naturalised. It is a perennial, tropical plant primarily grown as a root vegetable for its edible starchy corm, and as a leaf vegetable. 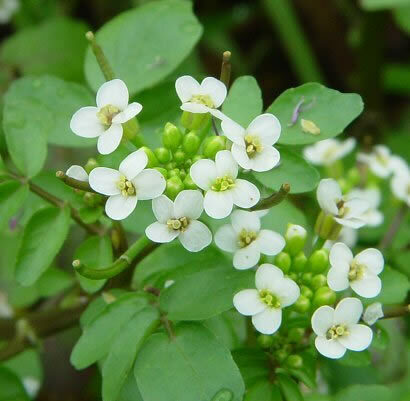 It is a food staple in African, Oceanic and Indian cultures and is believed to have been one of the earliest cultivated plants. Colocasia is thought to have originated in the Indomalaya ecozone, perhaps in East India, Nepal, or Bangladesh, and spread by cultivation eastward into Southeast Asia, East Asia and the Pacific Islands; westward to Egypt and the eastern Mediterranean Basin; and then southward and westward from there into East Africa and West Africa, where it spread to the Caribbean and Americas. 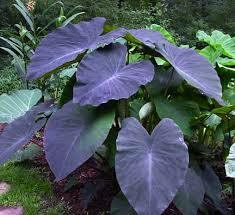 It is known by many local names and often referred to as “elephant ears” when grown as an ornamental plant. Aquatic variegated four leaf clover. A favorite of everyone who grows it! Real 1-3″ four-leaf clover leaves float on the surface of the pond as the trailing vine spreads under the water. 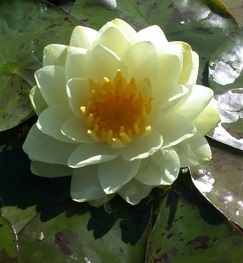 It does best when planted 4 inches to 9 inches below the surface of the water. Very easy growers, these plants are great for surface coverage and algae elimination. 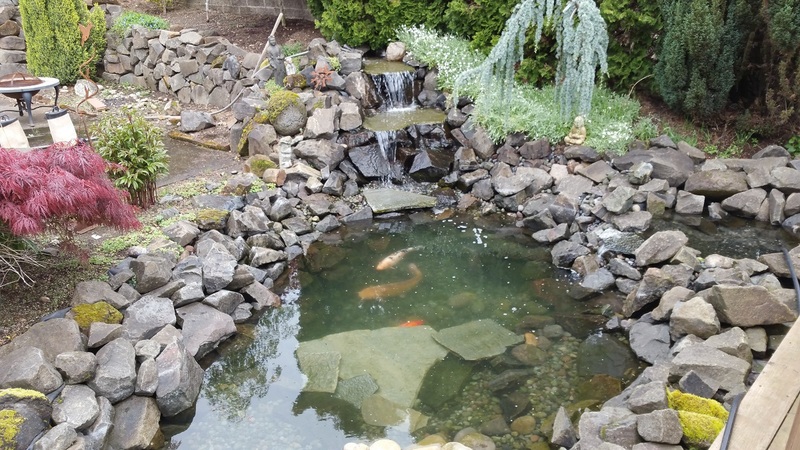 They also provide a protection from predators for koi and other fish especially important for vulnerable young fish. This Lobelia has a nice medium bluish pink flower. The hairy foliage makes a rosette thru the winter and into late spring, when the flower spike pushes upward to 36″ by mid summer. The flowers then open for a show that will last (including re-blooms) until frost. 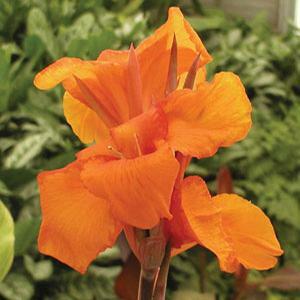 Will flourish in full sun or partial shade if planted in deep, moist soil. 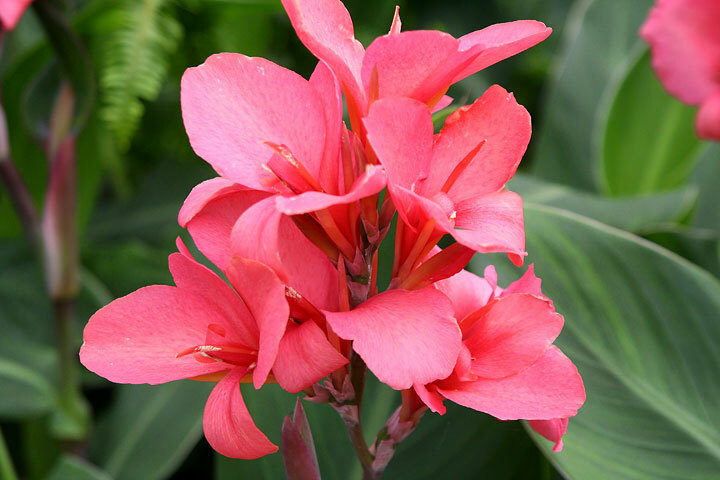 Light red dwarf, abundant, single blooms of 4–6 inches, very wide and flaring. Height 2–3 feet. Dwarf to small spread. 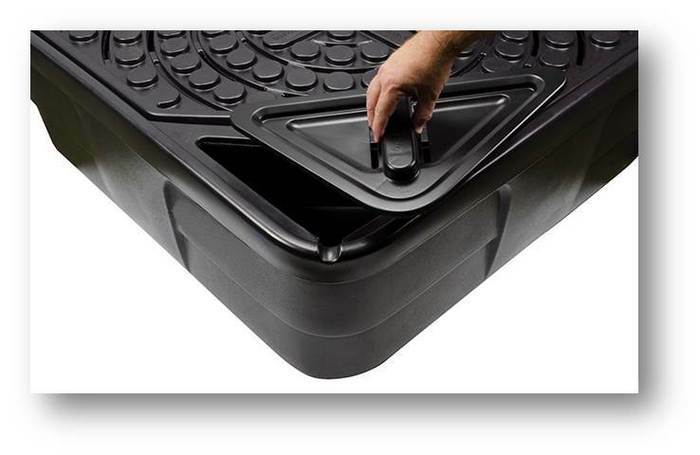 Good for containers and small to medium ponds with water up to 6 inches deep. 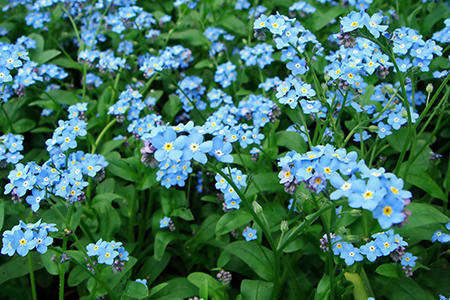 Noted for its prominent lavender-blue flowers and fleshy, rounded, floating leaves. 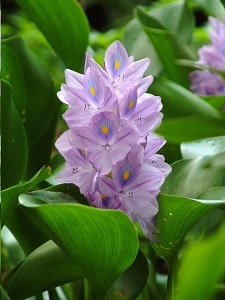 Water Hyacinth grows quickly in warm water. A few plants bought in the Spring can easily turn into a few hundred by Fall (they are excellent for compost in the perennial border or the vegetable garden). Plants propagate readily from leaf shoots which develop into new plants. 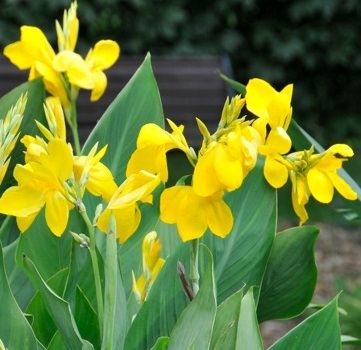 It is a welcome addition to the water garden for its ability to filter out unwanted nutrients and for its attractive flowers. Growing water hyacinth plants is easy. Once established, they require no special care except occasional thinning to keep them from choking out everything else in the pond. Under perfect conditions, a colony of water hyacinths can double its size every 8 to 12 days. 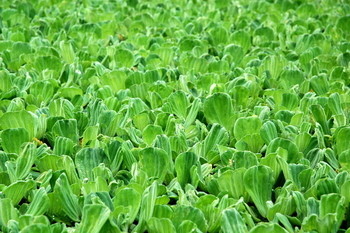 Water hyacinths need full sun and hot summer temperatures. 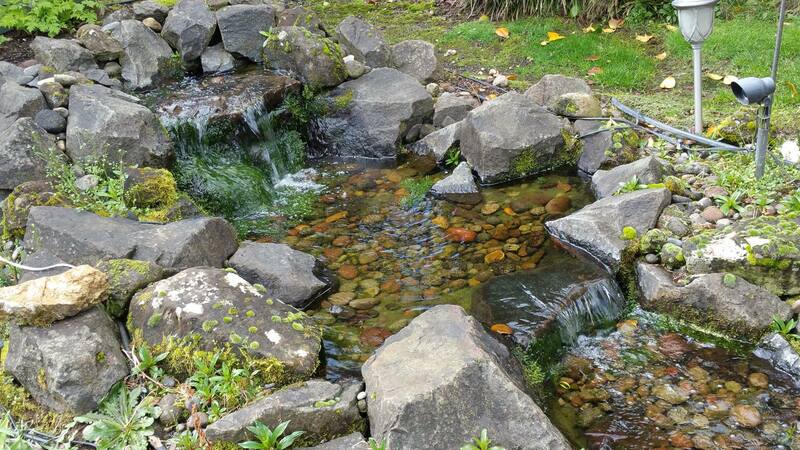 Introduce them to the garden by scattering bunches of plants over the surface of the water. They quickly take hold and begin to grow. 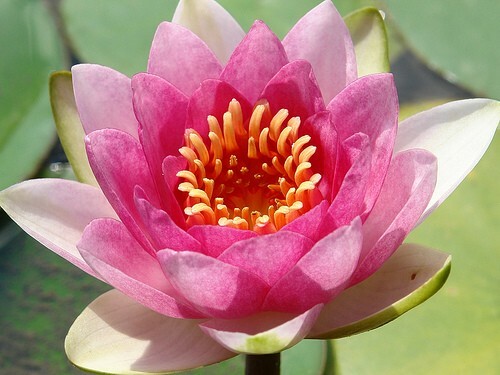 Thin the plants when they cover more than 60 percent of the water surface. Planting Depth: 2″ to 12″ as long as the top of the leaves crown out of the water. Lizard’s Tail is a favorite food of turtles, which eat the leaves. Bees love the flowers for the nectar. 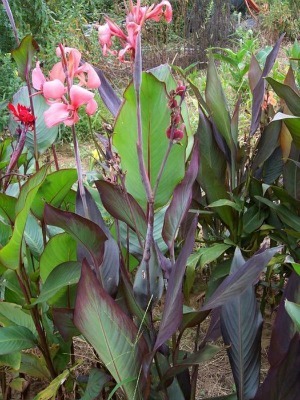 Lizard’s Tail is an important plant as cover and shelter, and as a place for egg-laying. Many fish, frogs, salamanders, crayfish, turtles, snakes, and insects hide among the stems underwater. Above the water line, insects and spiders crawl around on the stems and leaves. Dragonflies, frogs, salamanders, and many other animals will lay eggs on, around, or inside Lizard’s Tail stems. 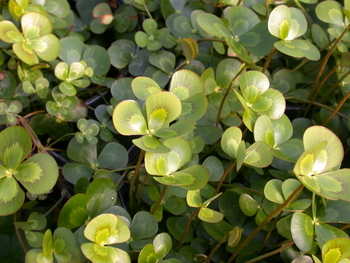 A mat-forming, semi-evergreen, aquatic perennial with fleshy, rounded to heart-shaped, bright green leaves and small, tubular, violet and white flowers in Summer. 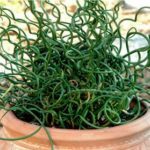 This is an excellent creeper that will love surrounding rocks, pavers or steps and is perfect for spilling over containers. Upright arching. 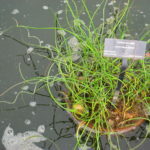 A small, aquatic sedge that resembles its giant cousin, Egyptian papyrus. Fine-textured, threadlike, terminal bracts and glossy, green umbels that grow to 2-3″ in diameter. 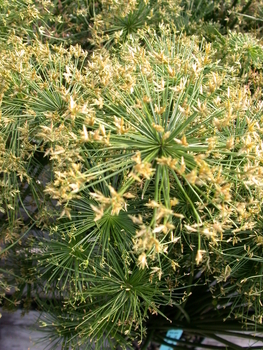 The flowers are borne in noticeable brown spikes. 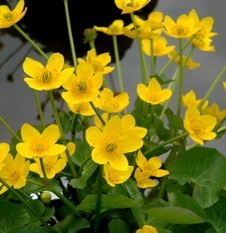 A wonderful accent in small pools, ponds, pots, or tubs, and a stunning choice for fresh or dried arrangements. 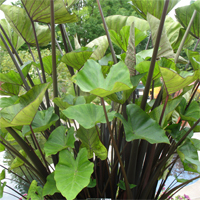 12 to 18″ tall with narrow needle-like leaves. This is a really delightful dwarf species. 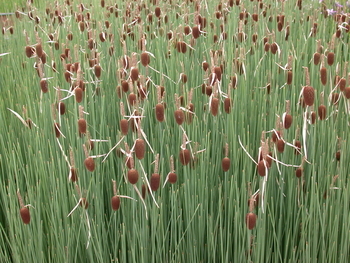 This unique micro-miniature cattail has delicate reed-like leaves which are bluish-green in color. Sporting masses of 1″, round, extremely attractive pokers. 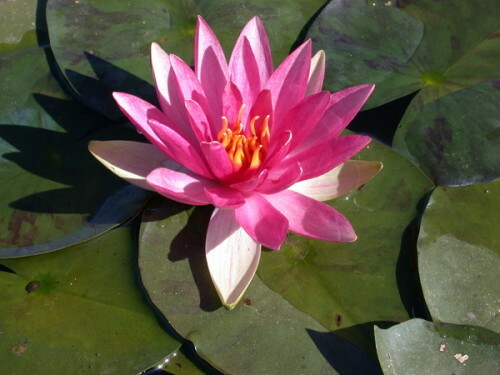 It is one of the most popular pond plants available. 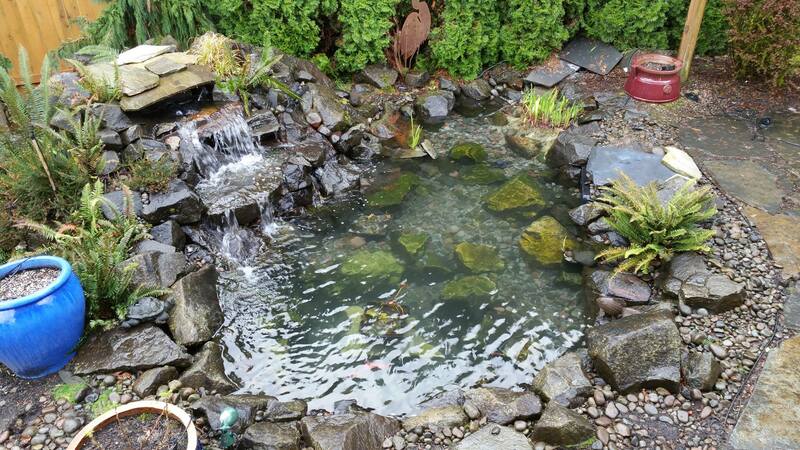 Good for natural and lined garden ponds, it grows in mud or up to 4″ of water and is non-invasive. Top of the pot should be 0-3″ below the water surface. This plant smells strongly of garlic or onion when bruised or cut. 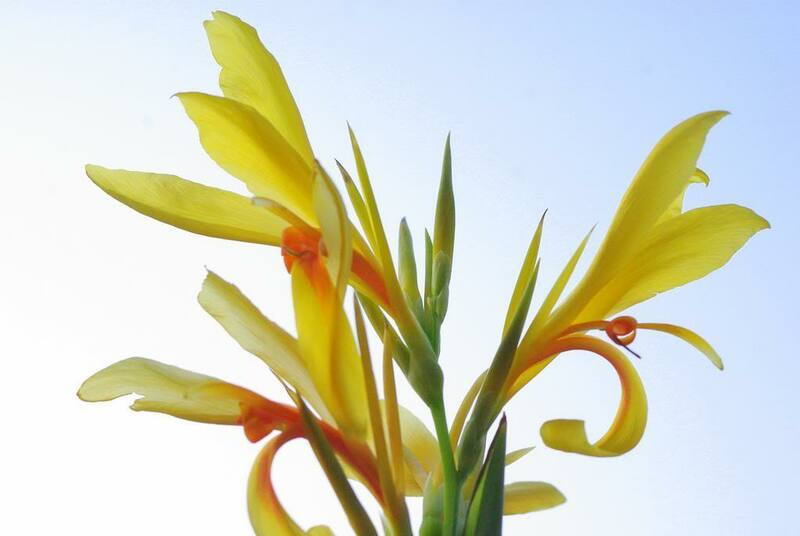 Grows to a height of about 1′. Dainty heads of lilac-pink flowers on stalks rise above blue-gray foliage having thin white margins. New growth has pink tinge in early Spring. Brushing against plants gives garlic-like fragrance. 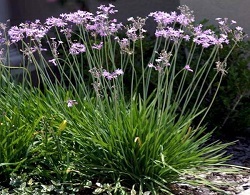 The leaves can be used in cooking like garlic chives and the bulbs can be used like garlic. 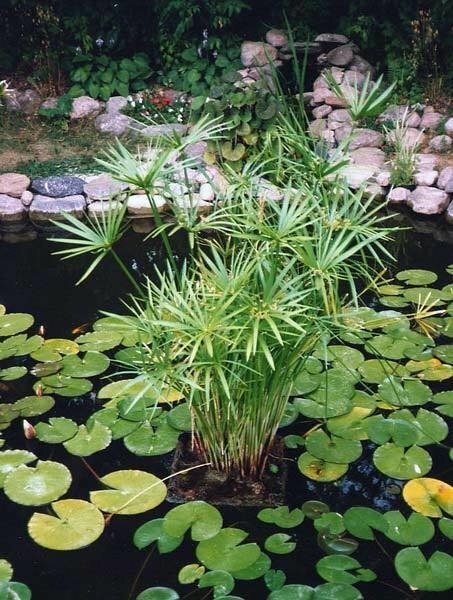 Very attractive plant for cooler water in the Fall, Winter, and Spring. Flowers in the Spring and again in the Fall. Water Hawthorne extends the season of flowers in the pond, blooming before water lilies in the Spring and flowering again in the fall after water lilies have finished blooming. Blooms are white with black stamens and have a vanilla fragrance. 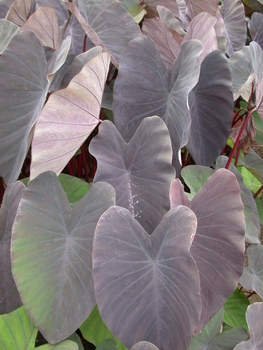 The foliage is elliptical, shiny, and dark green; Sometimes with a tinge of purple. 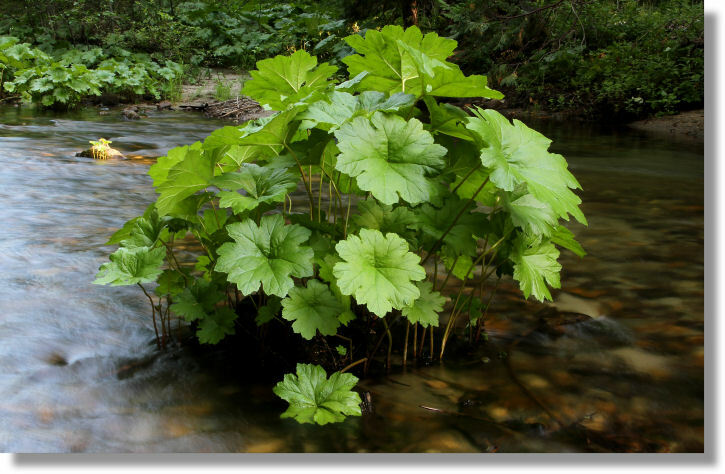 It grows in sun to part shade in water from 6 inches to 4 feet deep with a spread of about 24-30 inches. 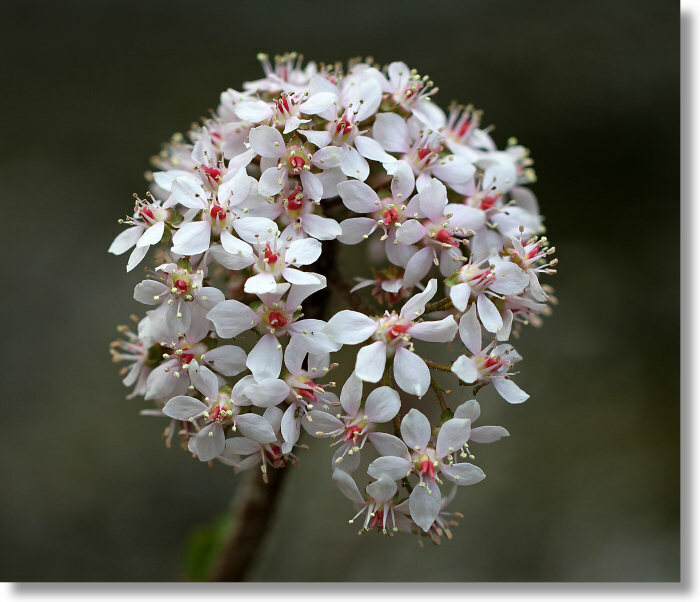 Water Hawthorne is hardy in cold water and can withstand a freeze; needing no particular Winter care or attention.